In 2016, Republican Francis Rooney won Florida’s 19th Congressional District by an astounding 31.8 points over his Democratic opponent, Robert Neeld. President Trump also won this Republican stronghold, which is located in Southwest Florida, by a massive margin (59.6% – 37.5%). In 2018, however, something quite unusual seems to be occurring within this typically red district. Democratic challenger David Holden not only seems to be in striking distance of current incumbent, Rep. Francis Rooney, but he seems to be convincing many former Rooney supporters to jump ship to support his own campaign. Now Francis Rooney doesn’t appear to even want to debate his opponent in a public forum. 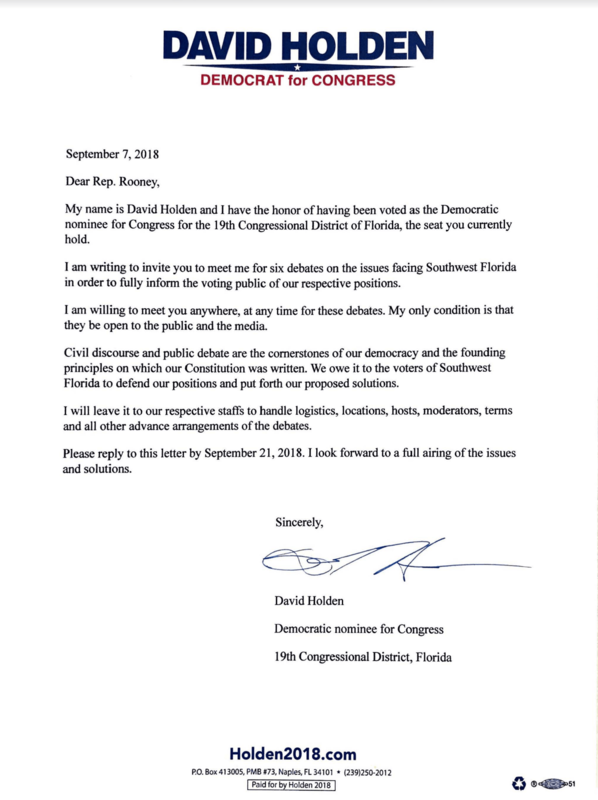 On September 7, 2018, David Holden sent one of many letters to Rooney, a copy of which has been obtained by Hill Reporter, requesting that Rooney agree to take part in six debates. The letter requested that Rooney reply by September 21, 2018, but Holden has not yet receive any response from the incumbent U.S. Congressman. The latest polls from Change Research, which surveyed 468 registered voters in Florida’s 19th Congressional District between the dates of September 10-12, show that Holden is only trailing Rooney by 1 point (47 to 46) with 7 percent of voters still undecided. Florida’s 19th Congressional District, which is made up of several towns, including Cape Coral, Fort Myers, Estero, Marco Island, Bonita Springs, Naples, Sanibel, and Captiva, has seen its economy hit hard by red tide and other bacterial and algae related issues. With Rooney seemingly reluctant to debate Holden, the one point gap in favor of Rooney may not last long. Florida voters typically enjoy debates, and with Rooney not responding to Holden’s challenge, this can’t possibly act in his favor. Hill Reporter reached out to Rooney for comment, but we have yet to receive a response.